After relinquishing their FIFA World Cup crown in Brazil in 2014, Spain's focus turns to Euro 2016 as they look to become the competition's first four time winners. A fine crop of new young players has emerged to ease coach Vincente del Bosque's task in developing a team that is a worthy successor to the one that became European champions in 2008 and 2012. At one time, Spain's reputation as a world football power was based almost exclusively on the exploits of its world-famous clubs, Real Madrid and FC Barcelona. 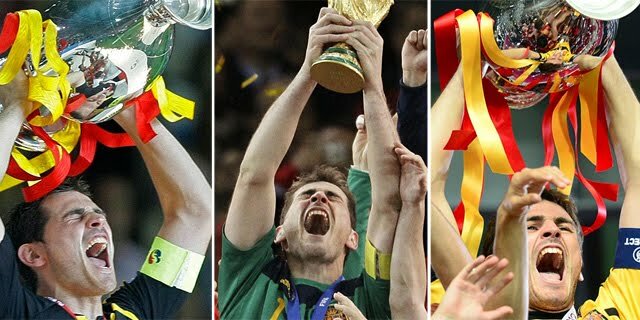 Then the national team embarked on a sensational run of three major tournament triumphs to confirm Spain as the great power of world football. Football first gained a foothold in the Basque region of northern Spain in the 1890s, thanks to migrant British workers. Indeed, Spain's oldest club, Athletic Bilbao, still retains its English title. The game spread rapidly, and was soon popular in Madrid, Barcelona and Valencia. The Real Federacion Espanola de Futbol was founded in 1913 and the national team made their debut at the 1928 Olympic Games in Antwerp. They reached the quarter finals on that occasion and again at the 1934 FIFA World Cup, with a team starring legendary goalkeeper Ricardo Zamora. Madrid and Barcelona, the Clasico rivals, provided glamour and glory to the early years of European club competition back in the 1950s, largely on the back of imported talent. Madrid boasted Argentina's Alfredo di Stefano and Hungarian Ferenc Puskas, while Barca had their own Hungarian trio of Laszio Kubala, Sandor Kocsis and Zoltan Czibor. But new Spanish heroes were evolving. Barcelona schemer Luis Suarez and Real's Amancio were key members of the Spain side who, as hosts, won the European crown for the first time in 1964. They defeated defending champions the Soviet Union 2-1 in Madrid's Bernabeu stadium to clinch Spain's first major international trophy. The national team went into decline for two decades until a revival brought quarter-finals progress at the 1986 Mexican World Cup. Spain's seniors reached the quarter-finals of both the 1994 FIFA World Cup and Euro 96 and then went on to command the world and European game in the 21st trophy. 'La Roja' as they are colloquially known, beat Germany 1-0 at Euro 2008, Netherlands by the same margin at the 2010 FIFA World Cup, and then Italy 4-0 at Euro 2012. Iker Casillas enjoyed exceptional success as national captain between 2008-2012. Del Bosque benefits from competition for places all over his team. Veteran goalkeeper Iker Casillas, with more than 160 caps, has been pushed by David de Gea behind a defence in which Real Madrid's Sergio Ramos and Barcelona's Gerard Pique put aside their club rivalries in the national interest. In midfield, Andres Iniesta and Sergio Busquets remain permanent fixtures, while the international retirement of Xavi has opened up opportunities for David Silva, Koke and Cesc Fabregas. Morata and Aritz Aduriz have enjoyed successful campaigns for their respective clubs, while rising stars such as Lucas Vazquez will be looking to make the most of their opportunity. 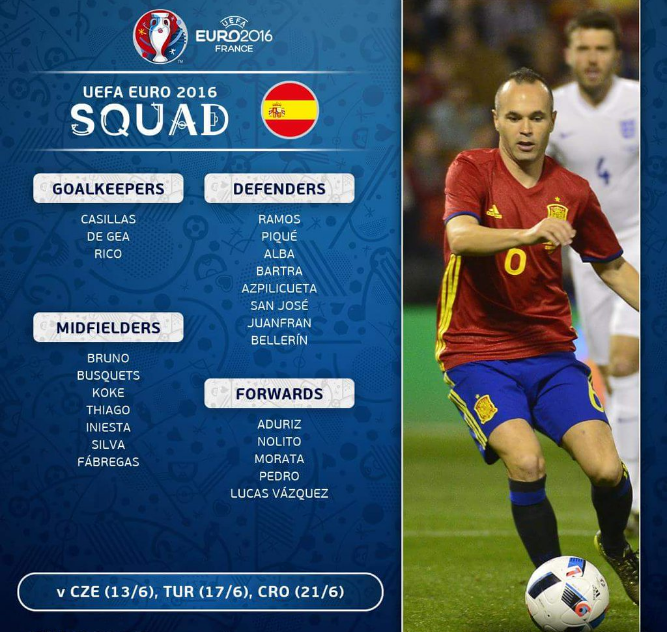 Not surprisingly, Spain had few problems securing their place at Euro 2016. They began their Group C campaign in style with a 5-1 thrashing of Macedonia and went on to win nine of their ten games, scoring 23 goals and conceded a mere three (equal with England as the best defence). A lone defeat, 2-1 away in Slovakia, was Spain's first qualifying defeat since October 2006, but they still ended the group five points clear of runners-up Slovakia and look like ominously dangerous title contenders once more. Spain will be out to avenge their calamitous display at the World Cup two years ago, and with that comes the challenge of a fresh-look side gelling on the big stage. I think the omission of Diego Costa is one that could hurt, a proven goalscorer who ended the season strongly with Chelsea could have made the difference. I expect Spain to be challenging for the title once again, but ultimately fall short in the semi-finals to an even better side. Euro 2016 Preview Series: Spain.